Interested in getting involved with Rugby League in Canada? 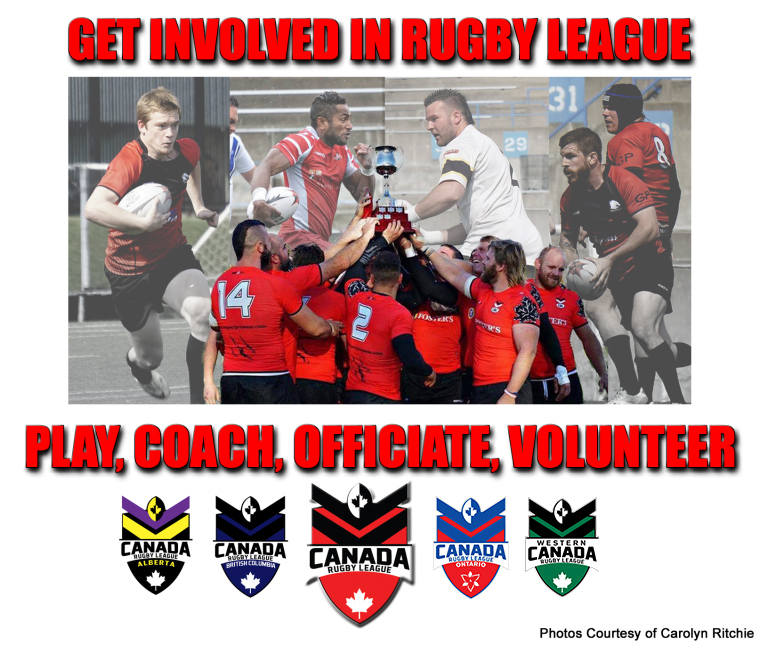 With domestic competitions in Alberta (ARL), British Columbia (BCRL) and Ontario (ORL) as well as representative Provincial Team programs and a very successful National Team Program in the Team Canada Wolverines, the Canada Rugby League Association (CRLA) is seeking people wanting to Play, Coach, Officiate or Volunteer. If you appreciate the benefits of volunteering and think you have something to offer, there are a number of ways to make it happen and we are always in need of an extra pair of hands. There are lots of opportunities and we welcome everyone to our game in whatever capacity you would like to be involved. If you are interested in playing, all players are welcome regardless of experience. Don’t worry if you’ve never played. The game is simple and easy to learn. If you’re willing to put in the time, coaching staff will teach you everything you need to know. Participation as a player in the ARL, BCRL & ORL Championship domestic competitions also provides players with the opportunity for Representative Team selection in the Alberta Broncos, BC Bulldogs or Ontario Impact Provincial teams as well with the Team Canada Wolverines, the national team of the CRLA. Selection in Provincial teams allows players to play against International touring teams while the Team Canada Wolverines provides players with the opportunity to represent Canada both at home and abroad on the world stage where the Wolverines are currently ranked 13th in the world. The CRLA is also very focussed on developing the game at the Grass Roots level and after successes in 2014 and 2015 with the U19 age group, 2017 will see the development of an U17 Junior Program in BC and Ontario that will result in a number of firsts including the first ever Inter-Provincial Game at any level with Team Ontario taking on Western Canada in Toronto followed by a Young Canada Wolverines ground breaking tour to Jamaica in August. Interested in coaching and developing the game? Have a general passion for the game and want to try your hand at coaching or helping coach a team? We’re always looking for Coaches. Coaching is both a fun and rewarding experience. Become a volunteer coach today! We can not play the game without our dedicated band of match officials. Refereeing is a fun, exciting, non-contact way to be involved with Rugby League. Not only do you get to see all the action from the best position on the field, but it’s a great way to keep fit, and meet new and interesting people. Successful Sports programs are more than just what happens on the field and while players, coaches and match officials are vitally important so are the many dedicated volunteers who work hard behind the scenes to help the game function. If you love the game, but don’t feel like pulling on the boots or you are even someone who has never picked up a Rugby League ball, there are plenty of opportunities for you to be involved in this great game as a valued volunteer. Volunteer roles include Athletic Therapists, Media Management, Ground Announcers, Marketing Management, Communications, Game Day Volunteers and Board and Committee Members.